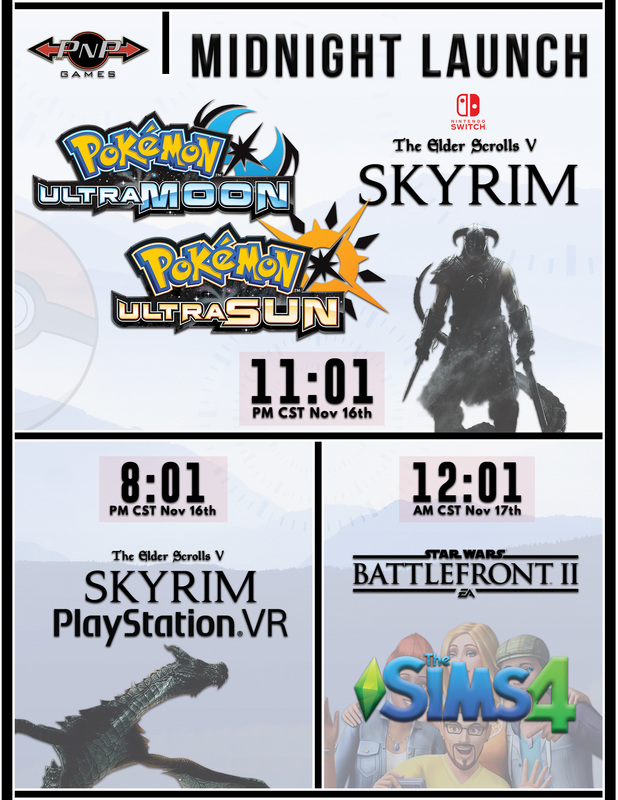 Join us starting at 11:01pm CST Thursday, November 16th, evening at any of our three stores for the release of Pokemon Ultra Sun + Ultra Moon for the 3DS family of consoles and The Elder Scrolls V: Skyrim for the Nintendo Switch. Skyrim VR (PS4), Sims 4 (PS4/XB1), and Star Wars Battlefront 2 (PS4/XB1) will also be available for purchase at the street date and time dictated by their respective publishers (currently 12:01am for Sims 4 and Star Wars Battlefront 2, 8:01pm for Skyrim VR). 8:01pm-9:00pm CST ; 11:01pm CST – Skyrim VR (PS4) is available for purchase in store. 11:01pm CST – Pokemon Ultra Sun + Ultra Moon (3DS Family of Consoles) & The Elder Scrolls V: Skyrim (Switch) go on sale as our stores reopen! 12:01am CST – Sims 4 (PS4/XB1) & Star Wars Battlefront 2 (PS4/XB1) are available for purchase in store.